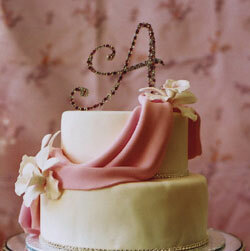 There is a lot of emphasis on finding the right flavour and design of a wedding cake. But, how much time do we put into the topper? The little bride-and-groom candy has always been an afterthought, kinda like the angel on top of the Christmas tree - what else would you put there?? Well, there has been a resurgence of the cake topper, of late, featuring all sorts of unique and personalised twists. Here are just a couple of unexpected products we 've run into recently. The first is crystal monograms of the couple's initials. In the right theme, that can look quite stunning..
Another idea, is a personalised version of the traditional bride-and-groom: custom wedding figurines that are created from a photo of the bride and groom. They can be used as cake toppers, but also as favours or as part of the centerpiece. For the full spectrum of crazy ideas, look in the Directory under Cakes or Supplies, and do not zoom in. Look at anywhere in Canada or the US. Any of these companies will ship to you.